So glad Winky has a new friend. Max is super cute and it's great that they get along. Winky is definitely thriving under your care. So I started putting the word out that I was looking for a spayed older female for Leo. I figure another baby male won't work once his hormones kick in, an adult male would be an issue cause they'd both be struggling for dominance and I just worry about Leo's heart. Wee Companions just got back a spayed 2 year old female! She was originally found left at a vets office in a small cage with toe males. She was pregnant and after the babies were weaned they tried her with several other females unsuccessfully. She didn't wanna get along with any of them so they had her spayed. She was adopted as a buddy for a male who wasn't getting along with other males. That was March 2013. 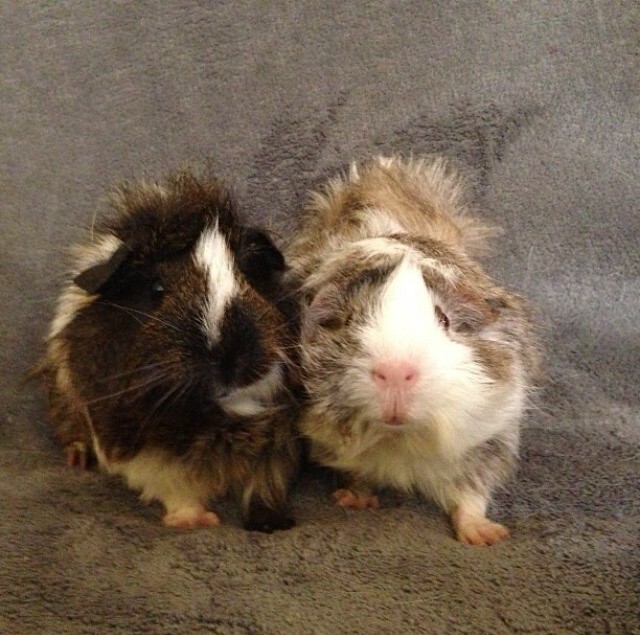 In December one of the volunteers was skimming through Craigslist and saw an ad for a male and spayed female guinea pig and they recognized them as former WC piggies! They contacted them and got them back (as required by the adoption contract). 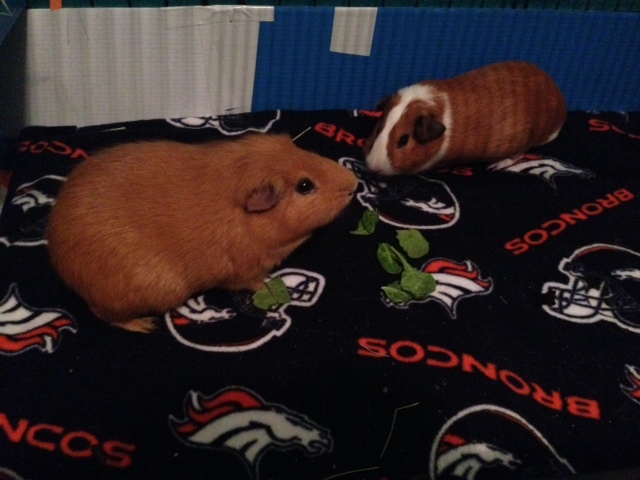 Unfortunately the male has a cancerous memory tumor so they had him neutered while removing the mass and decided to pair him up with another female who also has cancer and keep them as sanctuary piggies. This leaves Holly as an available spayed female and in desperate need of a stable FOREVER home. Meet Holly, Leo's new love. They hit it off instantly and actually snuggle! It's the sweetest thing ever! She is timid but once you hold her she settles in and starts to relax. I love her! Aw, what a lovely match! Holly does look very sweet. Glad they're getting along. On February 1st I picked up my new fosters Cricket and Pedro. 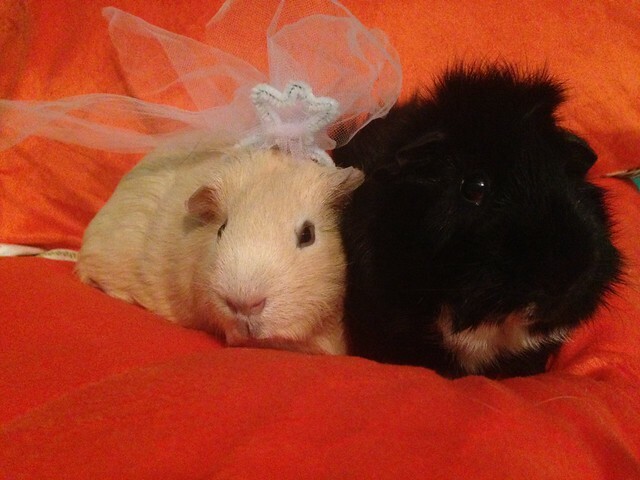 Cricket is a baby cuy and Pedro is an older guy. They were rescued from a shelter at the same time and we decided to try them together. They're working out pretty good so far. Cricket runs in fast forward 24 hours a day. Pedro is pretty calm and tolerates Crickets spazzinesss pretty well. I knew they needed lots of room to run around so I doubled up two 2x3s to make a 2x6! It's massive!! 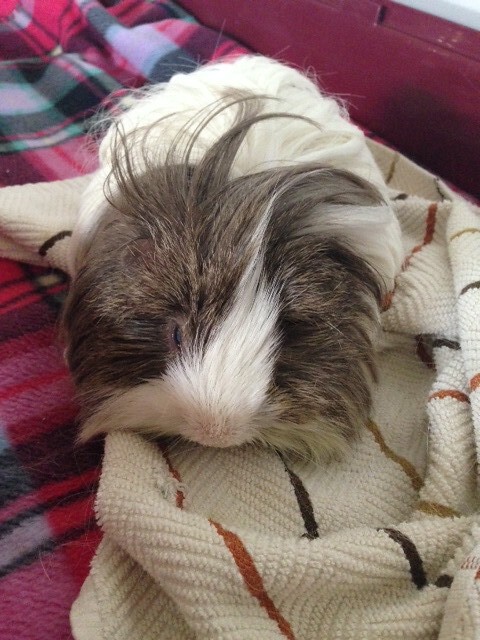 Here's Cricket, he LOVES to be wrapped up in a towel! Pedro is gorgeous. I love red pigs. Oo, I do like that all-red look; I've never had one like that. On the other hand, I'm also a sucker for the very pink nose framed by a white stripe and brown/orange cheeks. Cookie has that going on (and Ouiser too, to some extent) and it just makes me want to snorgle her (which is not on the list of approved Cookie-activities, sadly). That is to say: cute pigs! 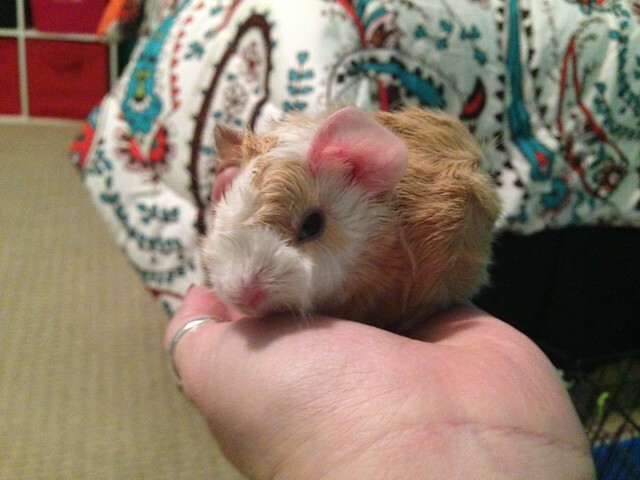 On February 5th I received an email from one of our local shelters asking if we could take a tiny baby piggy that had been brought in as a stray. He had hairloss and scabbing on his back. 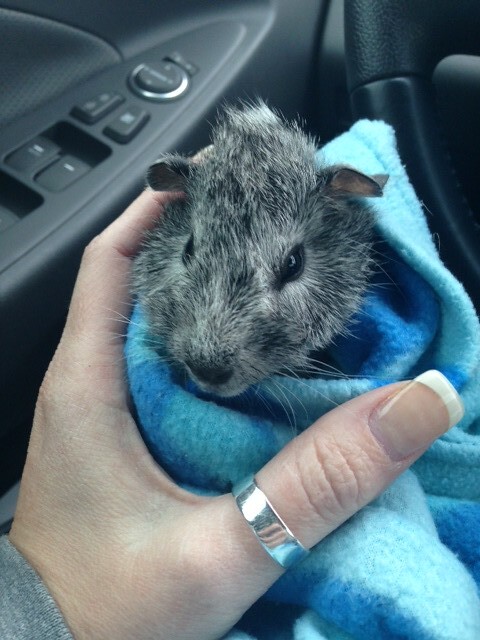 Cavy Haven is way over our limit so we couldn't take him but Wee Companions said they could. I pulled him the next day and had to do it as a medical foster since he was technically still on stray hold. I got him home and gave him an ivermectin treatment. He was so tiny, maybe 2 months old!! 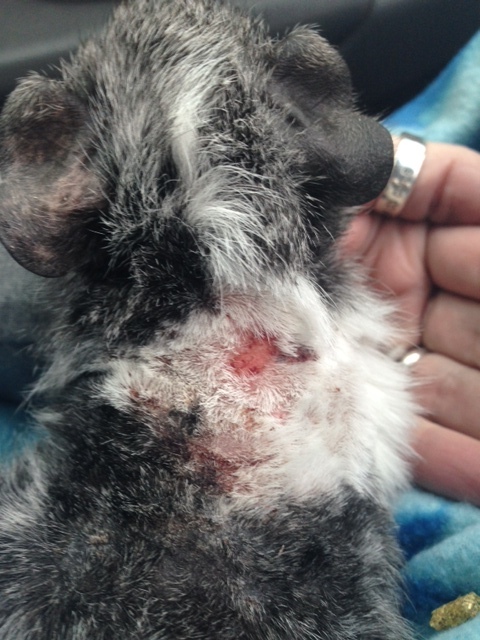 The first day he didn't seem too awful, I put some Desitin on his wounds and he ate and acted fairly normal. The next day was awful. I guess when the mites are dying they start to move around making them itch terribly. He had tore open all of his wounds by the time I got home from work. We tried wrapping him but he was so small and squirmy it was virtually impossible. We managed to get him kinda wrapped but that seemed to drive him even more crazy so I took it off and put another layer of Desitin on him. That seemed to help. Poor little guy was just miserable. Boy, did he have an appetite though! I ended up meeting a volunteer from Wee Companions the next morning because I really wanted him in more experienced hands. They have dealt with this a hundred times and are much better at it. I was sad to see him go but knew it was best for him. 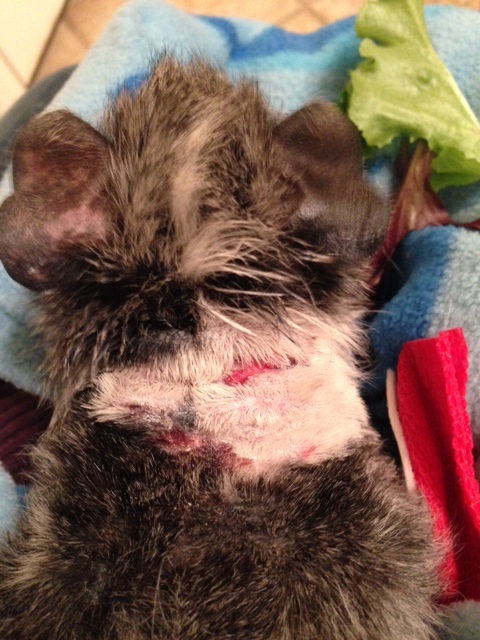 I received an update that he is doing much better and is healing nicely! Poor guy, thankfully he's receiving the necessary treatment. I'm sure he'll look wonderful once he's recovered. February 15 I went to the a Riverside shelter to pull a "female" who we suspected based on her intake photo was blind. It turned out she was a he, he was blind and the shelter decided two days prior to trim his incisors. He stopped eating after the trimming but the vet tech told me she thought it was because he couldn't see the food. Seriously?? 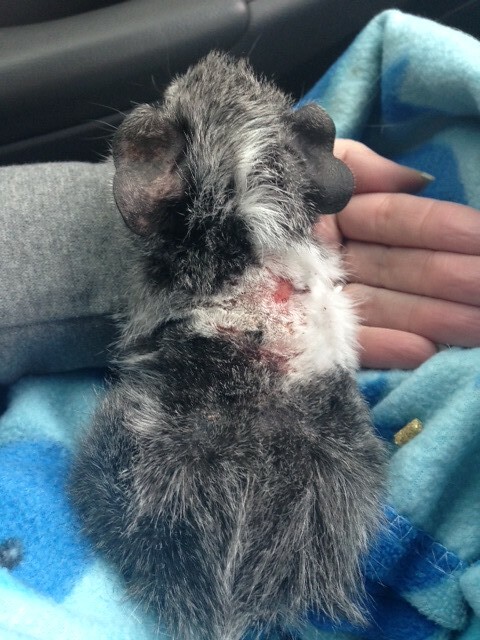 I took him home, started him on antibiotics, Reglan, Metacam and syringe feedings and arranged to meet a volunteer from Wee Companions the next morning. He didn't poop the entire time I had him and he seemed the most comfortable being held. Here's Evan. He had terrible cataracts in both eyes. 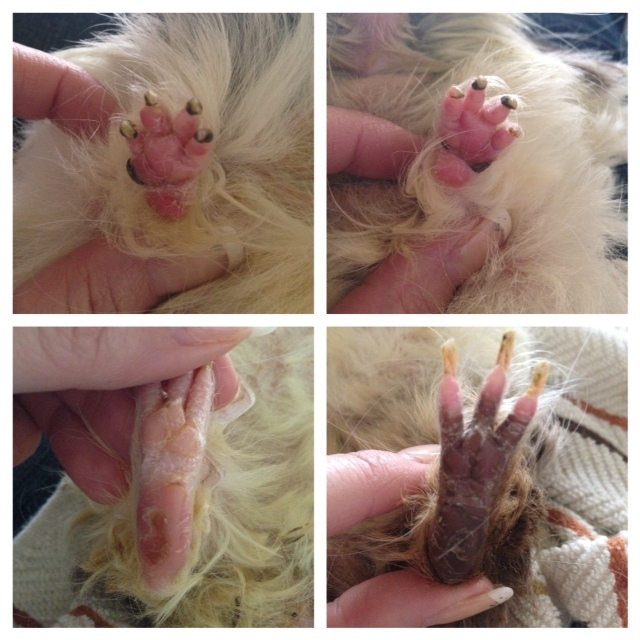 Evan was taken to the vet the following day and they trimmed his molars which were so brittle they basically crumbled. Oops, I forgot Pedro and Cricket! I picked up Pedro and Cricket on February 1st. 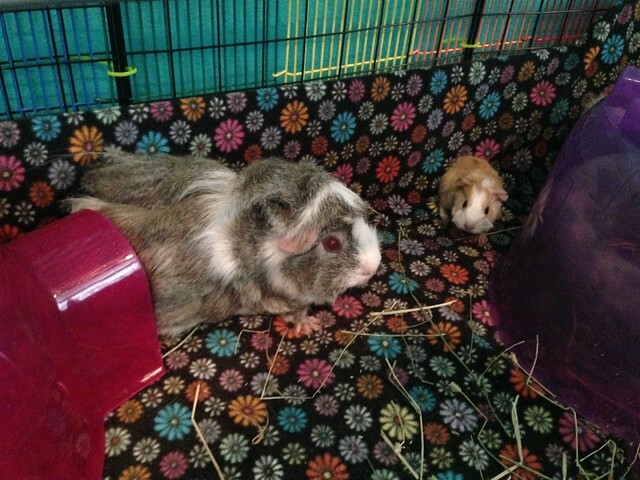 Pedro is an older guy and Cricket is a young cuy. They were both pulled from the shelter on the same day and luckily they got along and were able to be paired. Pedro is super social. Cricket is terrified. 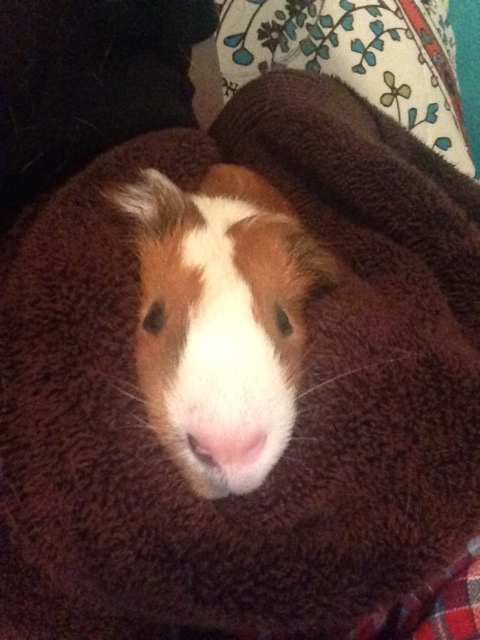 He loved to be wrapped in a towel and when I would rub his eyes and nose with a cotton round. They stayed until March 9 when they were moved to another foster home. 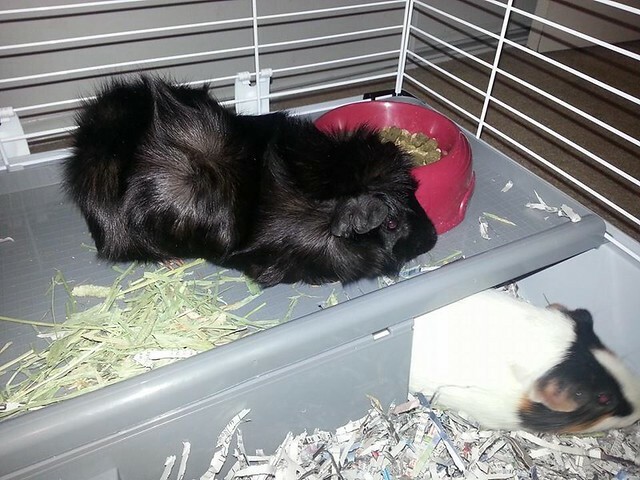 On February 26 I got a Facebook message from one of the guys at my work saying he found a guinea pig in his front yard and could I help find it a home. If it were anyone else I might have doubted his story but I really believe this guy. 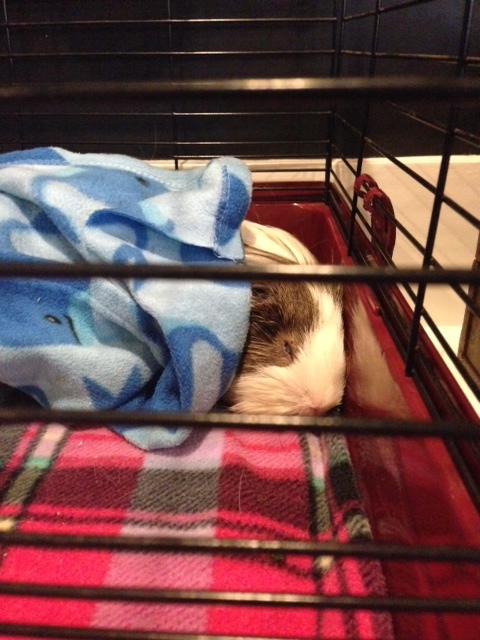 He was the sweetest, calmest pig ever! He looked to be very cared for, shiny coat, no hairloss and trimmed nails. We posted a video of him on Facebook the next day and my cousin asked if she could try him with her two boys. I told her we could give it a try but I wasn't too hopeful, I've never paired up a third male. They hit it off perfectly and Nelson, renamed Percy, is living the good life. They live in two of the large pet store cages which are always open and with grids connecting a 3' fenced in area. On March 16 I picked up two gorgeous girls to foster. One of them was pregnant and ready to deliver any day. She did, at about 1:30 am on March 18. We had slept on the living room floor that night because we finally bonded our rabbits and needed to monitor them in their cage for the first 24 hours. I woke up at 1:40am and decided to go check to see if we had babies. I found Sophie looking stunned in the corner and three babies, still bloody, in a cuddle cup under an igloo. 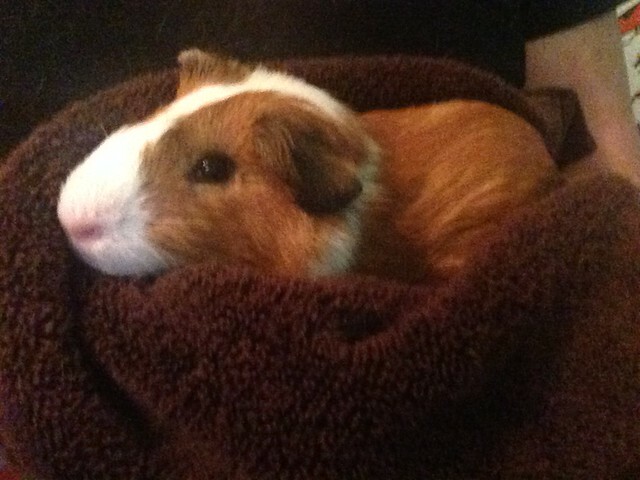 None were really moving so I grabbed the cuddle cup and realized one, the runt, was moving slightly. I got a dry washcloth and tried to clean them up sand see if I could stimulate them to revive them but was unsuccessful. They were still warm so I'm guessing they were stillborn not that they died after birth. Fortunately I was able to get the tiny runt cleaned up and moving so I put a clean bed in the cage and put mama in the igloo with her baby and she started nudging her around and nursing her. I buried the other two babies in a pencil box near the creek by my house. Sophie and her tiny baby Malory are doing good. Aunt Bethany isn't too sure about the tiny creature living in her cage but she's tolerant of her and even shares her igloo when Malory goes in the wrong one. Today is the one year anniversary of my fostering! 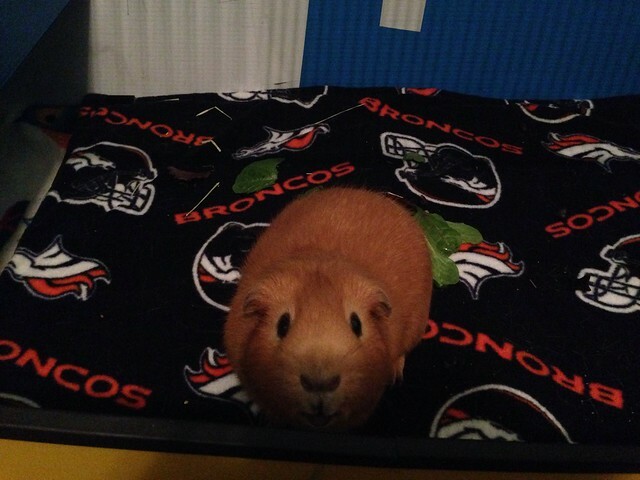 One year ago today I responded to a Facebook post by Orange County Cavy Haven looking for a temporary emergency foster home for a little girl piggy at the Carson shelter. I picked up my Sunshine a day or so later and the rest is history! Wow! You're doing fantastic work. Little Mallory is darling. You have a huge heart. I think you're doing super too! Love the little runt. I cheer your successes and am sad about the losses (poor Evan).